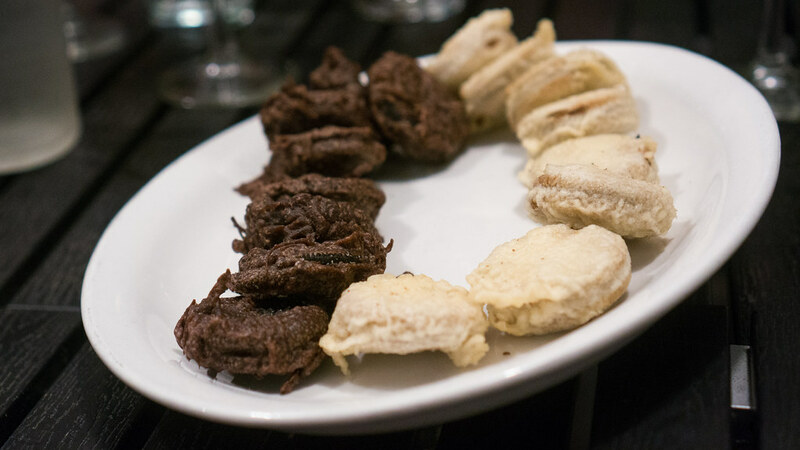 We mostly do this Cobaya thing to eat well and have fun, but occasionally we try to do good, too. 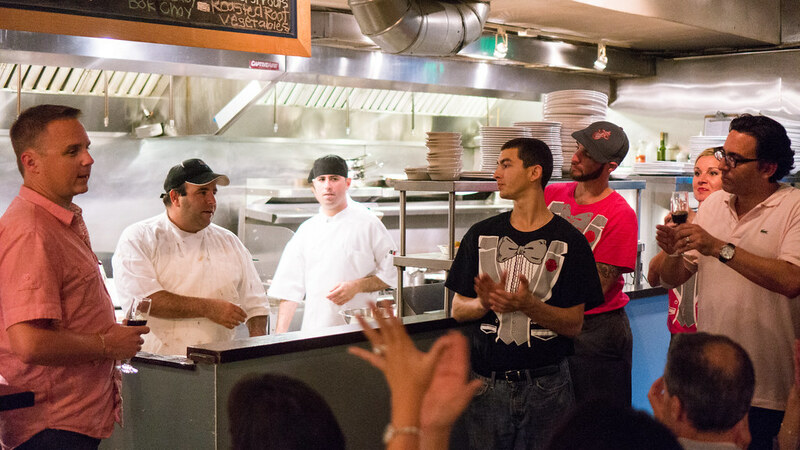 Almost exactly a year ago, we helped Chef Andrew Carmellini fill seats for a Hurricane Sandy Relief Dinner at The Dutch, which was a fantastic meal (with contributions from several Cobaya alumni) and raised more than $17,000 for Sandy relief efforts. 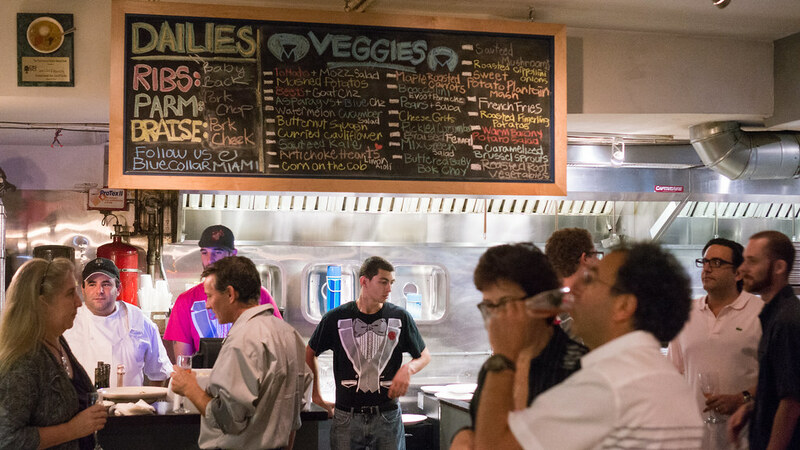 This year, when Chef Daniel Serfer of Blue Collar approached us about doing a charity Cobaya dinner to raise money for Susan G. Komen for the Cure, we were eager to take part. 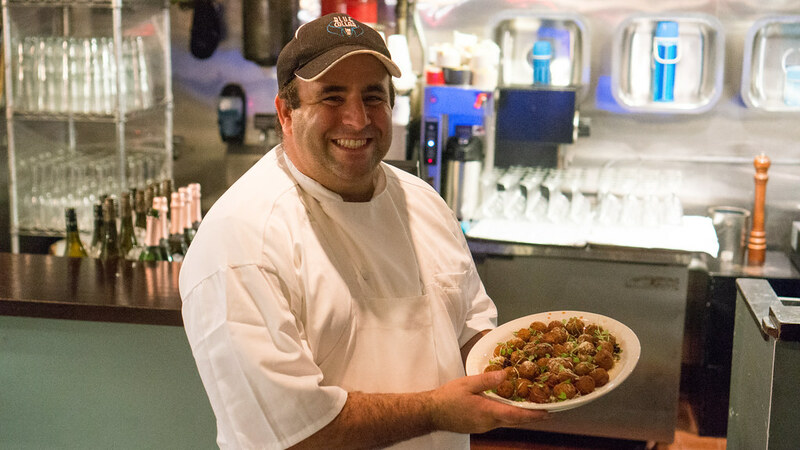 It's a cause that is particularly meaningful to Danny, who lost his mother to breast cancer eleven years ago this month, and he described the menu he put together as takes on some of her favorite dishes. I'll tell you this: Marsha ate very well. Though Blue Collar is, as the name suggests, a working-class kind of place, Chef Serfer has a fine dining background, having toiled at the now-closed Chef Allen's before opening his own place. And he's already thrown a few "White Collar" dinners at Blue Collar, complete with servers in tuxedo t-shirts. But this was something else. Oysters, caviar, stone crab, lobster, truffles, prime rib, foie gras ... it's a bit of a wonder we don't all have gout. It was indulgent and over the top in the best possible way. 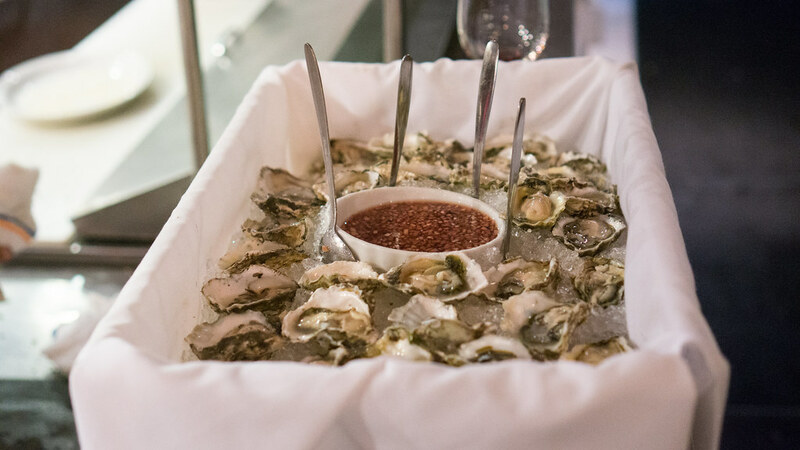 Oysters are a great way to start a great meal, and this one started with a bucket full of freshly shucked Kumamotos accompanied by a traditional mignonette sauce. 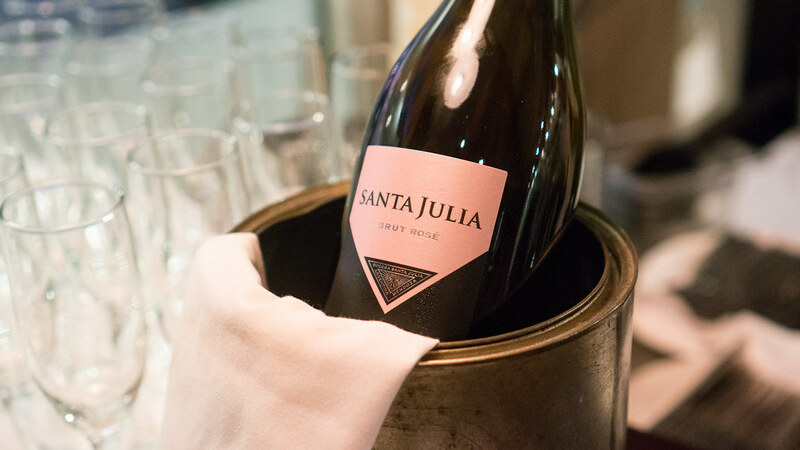 Bubbly always makes for a nice introduction too - a Santa Julia Brut Rosé from Mendoza Argentina in this instance, selected by one of Miami's best sommeliers, Allegra Angelo, a Cobaya vet who was pouring at her third of our events. 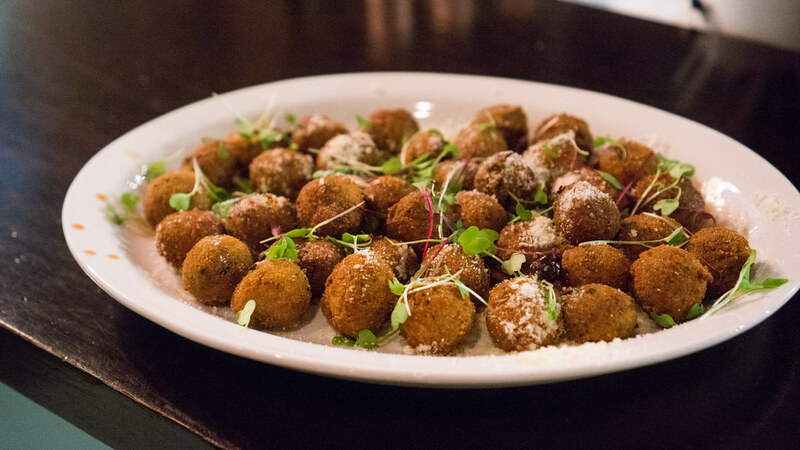 Another pass-around: porcini mushroom croquettes, with a crispy casing, a warm, creamy-textured, earthy-flavored mushroom purée inside, and a light dusting of parmesan cheese. 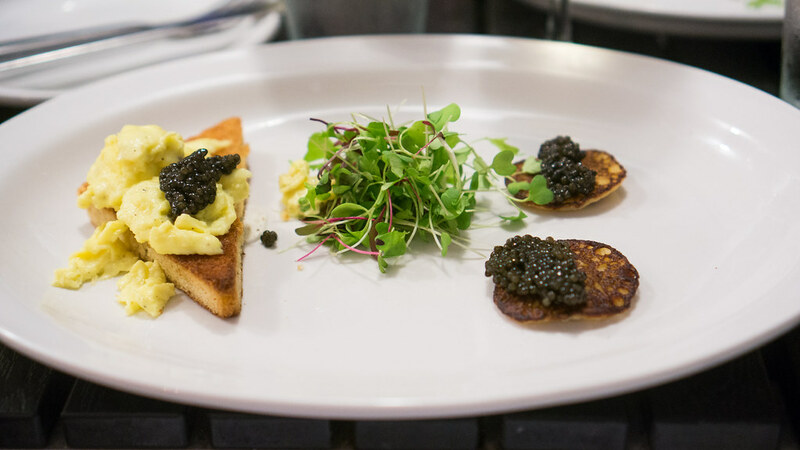 The first plated course began the sit-down segment of the dinner not so modestly: Kaluga caviar two ways, with scrambled eggs and brioche toast, and also over browned, buttery Yukon Gold blini. It was very nice caviar, and an elegantly simple presentation to let it stand out. 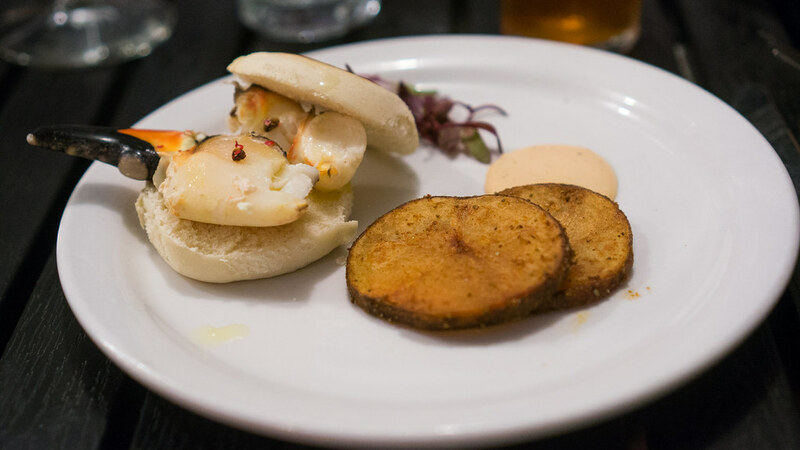 A local seafood specialty was next: stone crabs (the season started a couple weeks ago), subtly dressed with pink peppercorns and shallots, served on a mini Portuguese muffin with a couple disks of crisp fried, Old Bay spiced potatoes alongside. It was like some of the best things about Joe's Stone Crab - the crabs and the hash browns - on one plate. 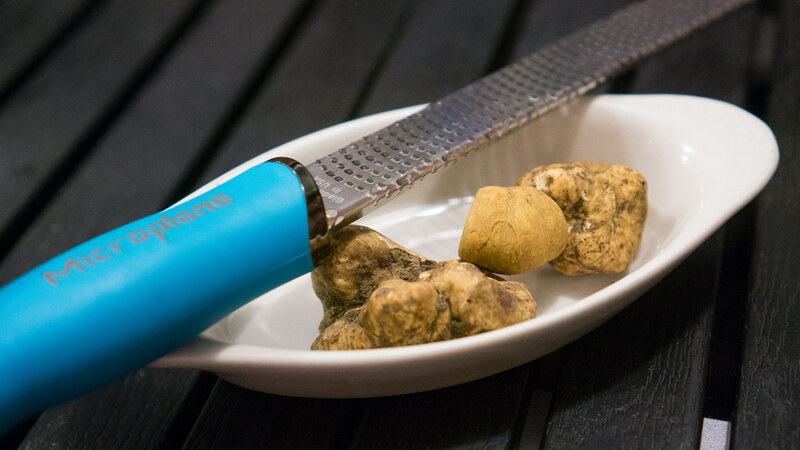 Given their expense, truffles are usually carefully guarded and parsimoniously administered, with some restaurants measuring out truffle supplements by the gram. 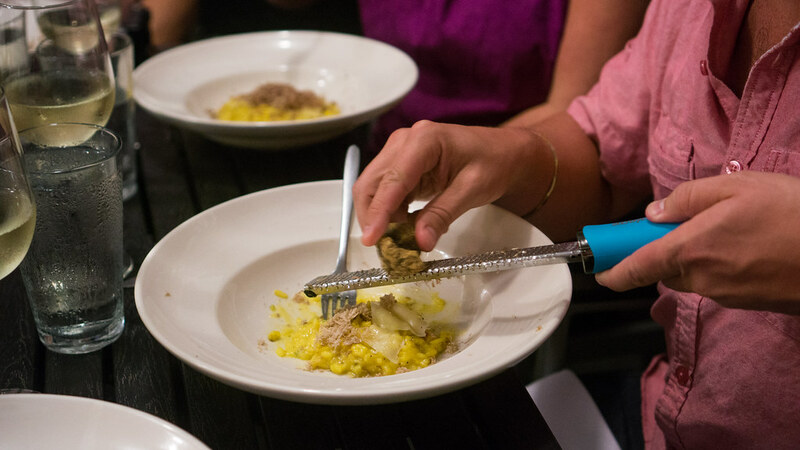 So setting out a few golf ball sized Alba truffles for each table was a pretty luxurious approach. These were some really magnificently fragrant truffles too - out of the ground four days ago, per Danny's supplier (Mikuni Wild Harvest). 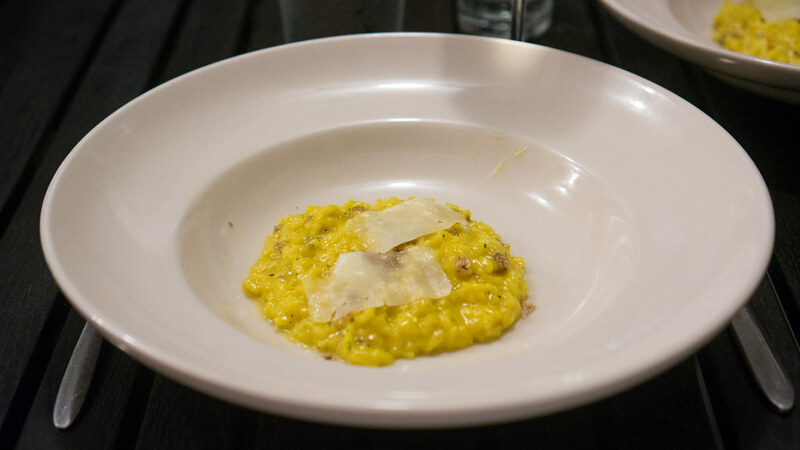 And while a Microplane may not be as elegant as those fancy shavers that shower thin slices of truffle, it did a nice job of releasing their musky perfume into the creamy, saffron and pecorino laced risotto. This was extravagant and delicious. 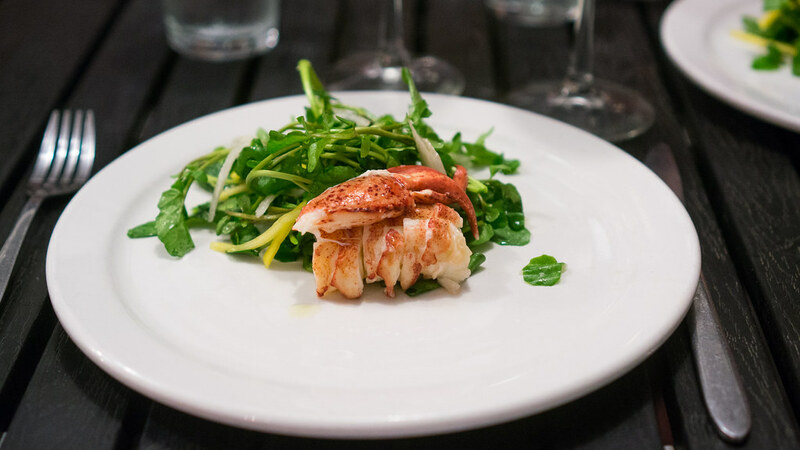 Because caviar and stone crabs weren't enough: a Maine lobster, de-shelled and chilled, presented with a tender whole claw draped over medallions of plump tail meat. 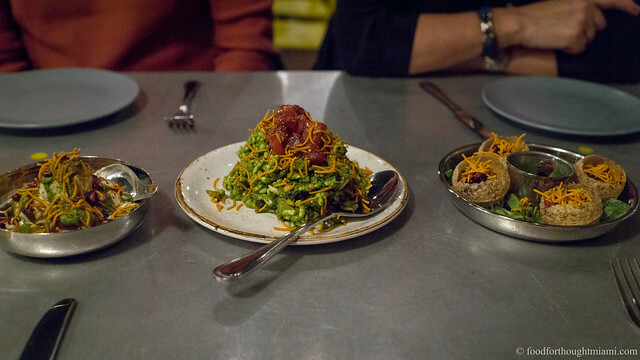 Alongside, a perky salad of peppery watercress and julienned slivers of mango and jicama. Danny and I both have fond childhood memories of the Newport Pub, one of those classic old South Florida places (there was another one at the Roney, which is now The Perry on South Beach). 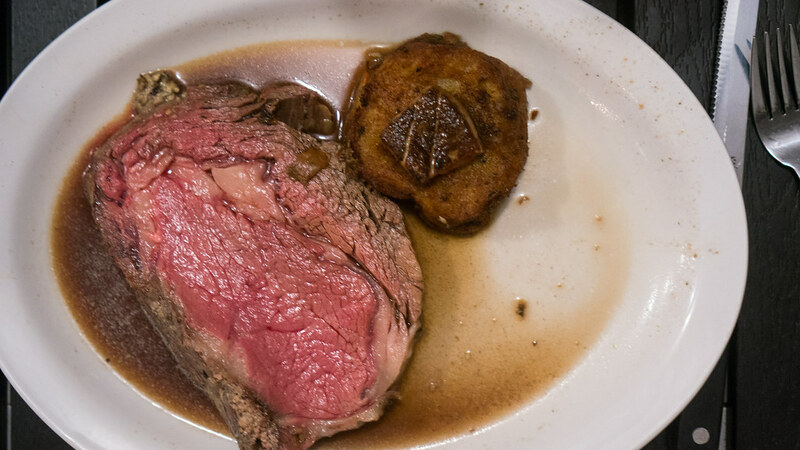 One of the specialties at the Pub, along with the wedge salad served with a quartet of dressings in a pewter revolving server, was their prime rib. Sometimes the romanticism of memory prevails over the reality of the present: some things are never as good as your recollection of them. But this prime rib was better than I ever recall having at the Pub. Perfectly cooked, with a nice inflection of spice rubbed onto its shell and permeating its way into the jus, and accompanied by a potato rosti topped with some seared foie gras. My only regret was that I couldn't finish it. 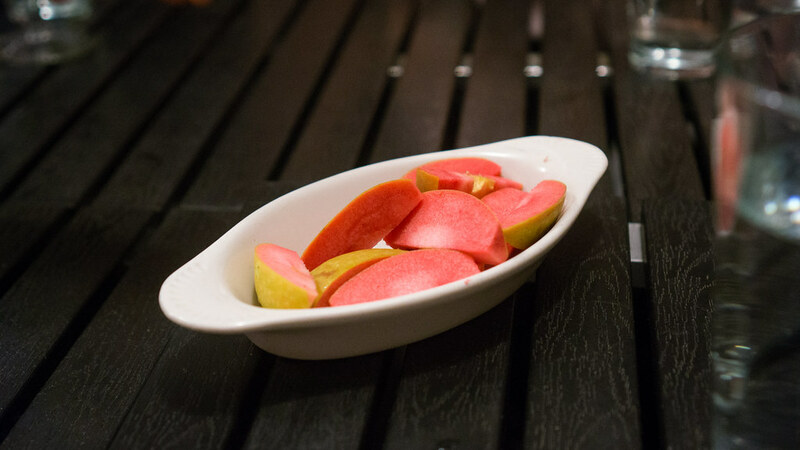 For dessert, a couple things I'd never tried before: "Hidden Rose Apples," with a gorgeous hot-pink hue to their flesh; and deep fried Oreos and "Newman-Os." I ate a couple more of the latter than I'd care to admit. A very hearty thank you to Chef Daniel Serfer for a very hearty meal for a very worthy cause, to all of his crew at Blue Collar for giving their time for the evening and for taking such good care of us, to Allegra Angelo for picking and pouring some great wines, and to all of his suppliers who contributed product. And, as always,- thank you to all the Guinea Pigs whose interest and support makes these events possible. and who helped raise more than $5,000 for Komen for the Cure.